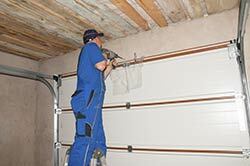 At Garage Door & Opener Repairs, we can install every type of garage door in the marketplace. We can also help you choose the best door for your needs and actually supply the door that we install. We do the job wherever you are located in Austin, TX and whenever you need the work done. We have the technical ability and experienced crews to do the work quickly and efficiently. It doesn’t matter if the door is at your house or you need a new, secure commercial door for your automobile repair shop. We cater to the needs of residences and businesses, providing a full line of attractive, sturdy doors in a variety of price points.